Regarded as North America’s dominant thoroughbred on the turf, the chestnut gelding defied pundits while also winning stakes races on the dirt and synthetic surfaces during a career which earned him an unprecedented collection of awards. Owned and bred by Morton Fink of Chicago and trained by Charles Lopresti, Wise Dan became the only horse to win three Eclipse Awards in both 2012 and 2013. He was American Horse of the Year, Champion Older Male and Champion Male Turf Horse. Unraced as a two-year old, Wise Dan captured nineteen graded stakes races. His 23 wins in 31 starts earned $7.5 million. He twice won the Breeders’ Cup Mile on the turf, but also set a track record on Keeneland’s Polytrack in the Ben Ali Stakes. On Tapeta footing he won the Presquile Isle Mile. His most impressive start on the dirt came in 2011 when he won the Clark Handicap at Churchill Downs. 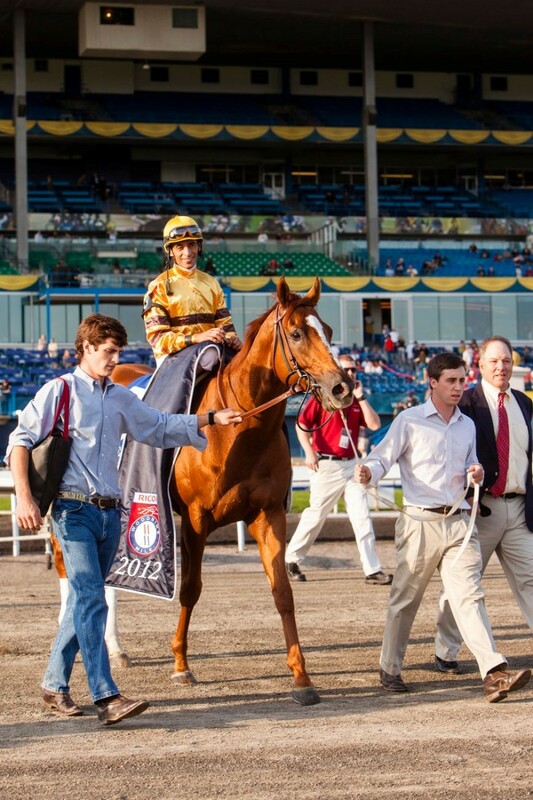 Wise Dan is best known locally when he became the first horse to win back to back runnings of the Woodbine Mile – 2012-‘13. In winning his ninth consecutive race, he set a record on the E.P. Taylor course. Over a yielding Churchill Downs turf course he didn’t disappoint bettors while stretching out to win the Turf Classic at 1 1/8 miles. As a 3-year-old he twice won at six furlongs, registering a 15-length maiden race triumph and the Phoenix Stakes at Keeneland.